An Electromagnet is the kind of magnet, which uses electric current to create a magnetic field. It can attract and magnetize ferromagnetic materials like Iron, Nickel, and Cobalt. It is easy to make a simple electromagnet at your home from household materials. Trim about an inch of plastic coating from both ends of the wire. Connect one end of the wire with the positive terminal of the battery, and other with negative terminal. Use the electric wire tape if necessary. Get some paper clips and bring your electromagnet near them. You will see the paper clips will be attracted towards your electromagnet. Disconnect wires from the battery, if wire or battery gets hot. When you connect the wires to the battery, an electric current flows in the wires. This electric current produces the magnetic field around the wire. The iron nail acts as a magnetic core. Magnetic cores are used to enhance the magnetic field. Use thick iron nail or bolt. Then, observe does it affect the strength of an electromagnet. Try above methods, and note down your result. In the end, you will find which method is affecting the strength of electromagnet most. 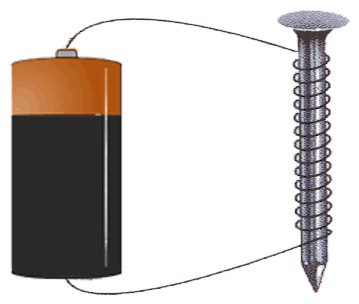 Abdul Wahab, "How to Make Simple Electromagnet," in Science4Fun, April 13, 2019, http://science4fun.info/how-to-make-simple-electromagnet/. we can even use different types conductors to see effects.